Thank you for promoting Prime Timetable! Our unique automatic timetable generator (the only one in the market that works in your browser of choice on both Mac and PC since 2009) has been rewritten from scratch to serve you better. It has been specially optimized for complex timetables and in some cases we have seen the increase in performance up to 5-10 times than before. In other words, it means that if you have waited for a couple of minutes for automatic generation to finish, you will wait in a matter of seconds, now. Well, just click play icon and let us know how it works for you. 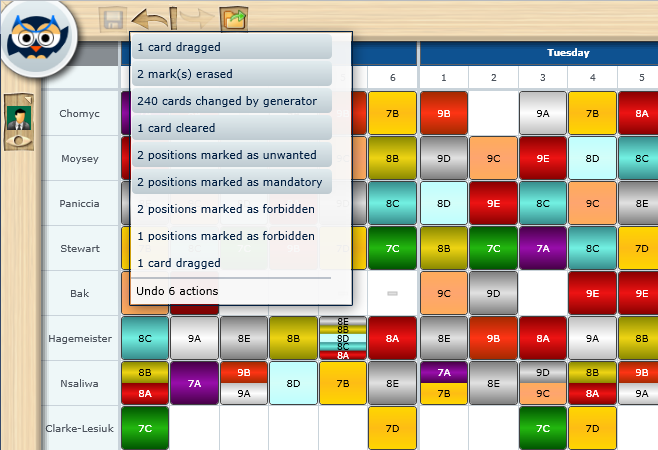 Simply add more than one desired rooms using More... button in Manage > Lessons > Add and that lesson will be displayed with equal number of cards in the room view. When dragging a card with several scheduled rooms, all related cards are automatically moved horizontally to a new position. However, only the card being dragged can be moved vertically so you can change its room without affecting other related room cards. You can manually choose any room, even if it is not in the desired or alternative room list. You don't want to get bored with your timetabling work, do you? The new markers will prove that previously slow and tedious task of defining constraints can be fun, game-like and yet more productive. Red , yellow and blue markers and eraser will let you easily draw or erase forbidden, unwanted or mandatory marks directly into any master, individual or extra timetable view. For instance, using red marker you can mark the 6th period as forbidden for a specific resource (class, teacher, room or subject) and the automatic timetable generator will respect your input and try to solve all the constraints for you. Based on your feedback we have improved custom periods and now you can define more than one custom periods during the default period. For instance, during the default period of 45 minutes you can add 3 shorter lessons of 15 minutes each. When adding new custom period(s), you will be asked if appropriate cards on default periods should be moved and resized accordingly, so you don't have to do that manually. Positioning and resizing of custom cards is also improved to better support gaps between default periods and different period intervals. As always, when dragging a card, the card shadow indicates where the card will be dropped. Click to undo and to redo any view changes. Apart from that, a new history icon lets you see all previous changes, so you can undo all or some of them with just one mouse click. History list is also helpful because every action has its description, for instance: 1 card dragged, 2 marks erased, 240 cards changed by generator, 1 card cleared, 2 positions marked as mandatory... so you get a clear picture of all previous changes. Both multiple undo and redo are animated, so you can see the cards moving from one position to another. Also, all changes are tracked in the instant validation window, which helps you decide which position better suits you. Adding a lesson without teacher or class is improved. Days and periods can be repositioned just like other data. Teacher's statistics will take custom periods duration into account. Black and white (monochrome) printing mode added. New "Use 12-hour clock" option added in Help > Options. When editing a lesson, previous card positions are remembered. Better detection and user experience for iPad and iPhone users. Use markers, but if you miss old Marks button we can enabled it for you. Old generator is still there just in case, and can be enabled for you. Subscription expire date is displayed in Help > About. Is there anything you would like to have included and it's not there yet? Share your idea in our online user voice. Once again we would like to thank you for your continuous support and we wish you enjoyable timetabling. The most requested feature is here. You can enter any period interval for any day/period (and class/teacher/room/subject), and appropriate cards will be resized and repositioned accordingly. Custom periods are logically and smartly grouped in the grid and can be easily filtered. Furthermore, you can add custom intervals inside the card by checking Help > Options > Show period intervals instead of numbers. It's prime time to buy Prime Timetable for as low as $14/month in US and €14/month in Europe (prices are based on 5 years plan). Are we serious? You bet! Many have already taken advantage of this offer, so hurry up! Until August 1st, we are offering up to 50% discount for 2 or more years purchase. Use the slider on the plans and pricing page to choose your billing term and special discount. If you are an existing user and looking for upgrade, just choose Help > Purchase/Update. Having an ever increasing number of schools using our services, we had to make sure that all teachers and students get their timetables timely and efficiently. The new web server means faster, more reliable, secure and efficient timetabling and so much more. And yes, you can download and start Prime Timetable in just 1 second now. Desktop application is now available for both Basic and Premium plans. Choose Help > Options > Install Prime Timetable and the software will be installed on your computer, so when you start the application by clicking desktop icon it will automatically do the log in for you. Desktop version is available for both Mac OS X and Windows and we especially recommend using it on school computers with a slower Internet connection. More than 20 new timetable examples are added from various countries around the world. There are lots of minor improvements and fixes that you have suggested, such as: setting 1 minute interval on the period form, the ability to print conflicts, the new context menu (use right mouse click on the card to edit lesson, access card designer, pin/unpin and clear), etc. Our help and manual has been updated to reflect the latest changes. The web site has been redesigned in order to present our services more clearly and user friendly. If you are satisfied with our product, please share https://primetimetable.com/ link with other teachers, principals, principal assistants, and others. You can also use the new "Spread the word" section in the footer of every web page to like us on Facebook, share a link on Twitter, Google Plus or LinkedIn. Your help is much appreciated! Enjoy the new release and use online user voice to suggest a feature or add new ideas that you would like to see in the Prime Timetable. Happy summer timetabling! Hoot, hoot, a brand new Prime Timetable 4.0 is here! A unique school timetable software for Mac and Windows just got better with over 100 new features that you have requested! We hope you will enjoy using it as much as we enjoy making it. There are some really awesome and exciting features that we are eager to share." What you see on the screen is what is going to be printed. It's simple as that. You can easily print and customize both master and individual timetable view(s). The software will automatically do the paging when printing master timetable, and print timetable on a separate page when printing individual timetables. Use right mouse click on a timetable card to access card designer and customize style and appearance in any master or individual timetable view. You can customize background color, displayed text and border style and it will affect what is displayed on the screen, published web page, and how the timetable is going to be printed. All settings are saved inside a timetable document so you don't have to tweak it anymore. Use Owl > Share > Share with others to share school account with other teachers, colleagues, etc. You can specify any of the following privileges for newly created users: owner, creator and viewer. The owner can manage other users, the creator can create and modify timetables and the viewer can only view timetables. Click on validate icon to turn on instant validation which provides immediate feedback upon any timetable change! Validation results window lists all timetable imperfections grouped and sorted logically. By selecting a timetable imperfection, adequate markers are displayed in the view. Validation markers are represented by red blinking rectangles appearing in any problematic period or card in the timetable view. Markers are transparent so you can easily spot and drag problematic cards to a better position and get instant validation feedback. Ever wondered if it's possible for two or more users to work on the same timetable at the same time? Well, yes it is! Welcome to the timetabling collaboration platform where you can collaborate both online and offline and let Prime Timetable do all synchronization for you. Do you already have school data in a Microsoft Office document? Maybe in Google Docs? No problem! Now you can easily exchange school data with Microsoft Office, Google Docs and similar software which will significantly reduce endless typing. Prime Timetable will smartly recognize the format and do the parsing for you. In the new version we have enabled adding custom period labels, e.g. "Break", "Lunch" etc. 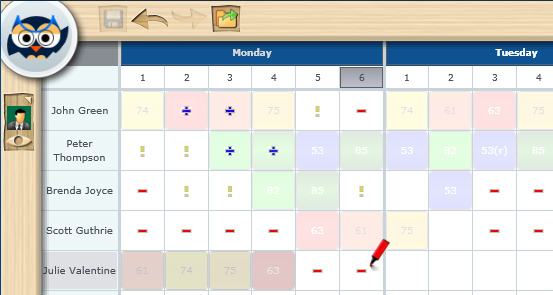 Also, it is possible to select more working days in a week and more lessons per day, so that you can set up to e.g. 10 days with 25 lessons, or 25 days with 10 lessons each day. In some countries/regions there are still schools which use slower Internet connections. That's why we have put a lot of effort into optimizing the time needed to download and view timetables. As a result, downloading and viewing timetables is 10x faster than before and is only a fraction of what it takes to open Facebook, Gmail or Hotmail. Wow. Lightning fast! If you're a timetabler working on a campus school, you may face some extraordinary timetabling challenges, e.g. the need to create a timetable for elementary and middle schools with a possibility of some teachers and classrooms being shared in both schools at the same time! In such a case, you can work on two or more separate timetables and then merge them in order to find out if there are any conflicts with shared teachers or classrooms. These are just some of the highlighted features and we are already working on some exciting new ones. Since its launch 2.5 years ago, Prime Timetable has been updated on weekly basis (! ), so you can expect more goodies very soon! Thank you all for your support and great new ideas. Oh, and if you are satisfied with Prime Timetable and would like others to know about it, please spread the word. Until the next time, we wish you and yours a happy holiday season and happy timetabling! I am proud to announce the release of new Prime Timetable 3.0 which brings the latest innovations in school timetabling at your fingertips and mouse clicks. Thanks to you I have grown much wiser and learned a lot ow(l)ing to your great online feedback and ideas, 90% of which has already been implemented! We are eagerly waiting for your new ideas and in the meantime check out our hot features." Prime Timetable works natively on both Mac and Windows as well as in any modern browser but this time we have made it accessible on any device with Internet access. In other words, now you can use your mobile phone to sign in and browse through your school timetables. Also, the teachers and students you have shared your timetable with can view it on their mobile phone. Our software will automatically detect your device and instead of full blown Prime Timetable, a new Mobile Timetable will be shown, which is entirely built using standard web technologies accessible everywhere. Experience all advantages of sharing your school timetable on iPhone, iPad, Android, Nokia, Windows Phone... or any other smartphone or tablet. How to spot a lesson conflict in a 2D timetable? How to discover that under a card there is another card or many more? The answer is simple. 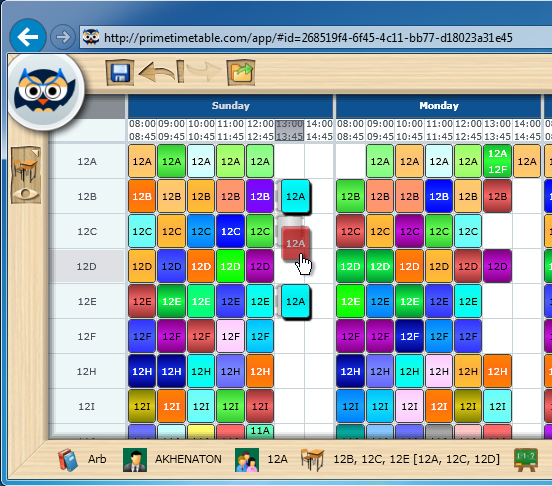 Prime Timetable will automatically rotate each conflicted card by 30° to the left and right respectively. Also, each card has its own Z-order on Z-axis, thus creating a 3D timetable. To emphasize 3D even more, the shadow of the card being dragged is darker when dragged over the conflicted cards and lighter when there are no cards below. Clicking a card at the bottom brings it to the front, while other cards automatically rearrange. 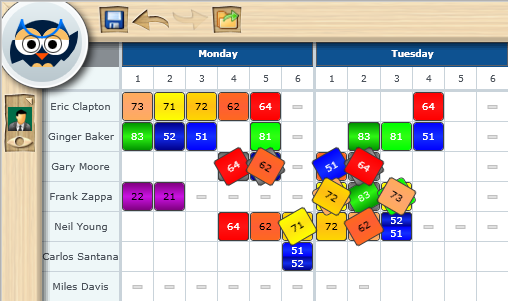 As always, to bring you the best timetabling experience all rearranging, rotating and moving is smoothly animated. Extra views are a great help if you want to adjust cards using only drag & drop (also known as manual timetabling). These views are fully interactive, just like the main view, meaning you can use all timetabling tools as usual, e.g. timetable generator, drag & drop, pin, sponge, undo/redo, etc. Of course, all opened timetable views will be automatically updated. To open extra timetable view just click on teacher, class, room or subject icon in the bottom left corner when a card is selected. You can easily adjust the position and size of extra view which best fits your screen and display single extra view by clicking the first column. Currently selected card in one view will be highlighted in all other views. Also, when doing drag & drop, the shadow of the card being dragged will be shown in all opened views, which allows you to track drop position, e.g. check that drop position is not already scheduled in another view. Prime Timetable makes sharing easy: just choose 'Share -> Publish to the Web', click Publish to the Web button and voila! Your timetable will be visible to anyone you've shared the link with. The published web page will be accessible by any Internet device, so that people you share with can access the timetable even from their mobile phone. You needn't worry about any subsequent changes to the published timetable as it will be automatically updated when the timetable is saved. Furthermore, the published web page will refresh every 20 minutes to ensure the latest timetable version is delivered to all. Here are some online examples of published timetables: Example 1, Example 2, Example 3, Example Brazil, Example Egypt, etc. As always, you can click on the first column to open single timetable view. In case your school doesn't have reliable Internet connection or you would like to use Prime Timetable instantly from your desktop without going to web site and signing in, we now support both online and offline school timetabling. Even if the Internet connection drops or you are only occasionally connected you can still continue working on your timetable. When the Internet connection is back, your local changes will be synchronized with our server so that you can share your timetable with others. For our premium customers we've even enabled entirely offline timetabling work. Just go to Help -> Options and click Install Prime Timetable button which will install the software on your computer. You will get the newly installed program in Program Files and a new desktop icon. Starting Prime Timetable from your desktop allows you to access your timetables whenever you want with or without Internet connection and thus avoid going to Prime Timetable web site and signing in. Instead of Microsoft Office ribbon we have introduced good old wooden board and instead of classical popups we have turned to recycled paper as the background of our forms. Luckily, no trees were harmed or cut down while turning our user interface into more eco-friendly environment :). We hope you like our new redesign! Pin , sponge and zoom make timetabling more productive, yet game-like. All timetable view operations such as drag & drop, pin, zoom, print, undo/redo and others are also available in single class, teacher, room and subject view and extra views. To select single view just click on the first column in a timetable row. The new Help -> Options form allows you to tailor the school timetable to suit your needs, e.g. you can set default timetable view, set save reminder interval, set whether conflicted cards need to rotate, show or hide rooms in single view, show subjects in teacher view, show period intervals instead of numbers, show additional time request settings, exclude fake lessons while generating the timetable and Install Prime Timetable on your desktop. 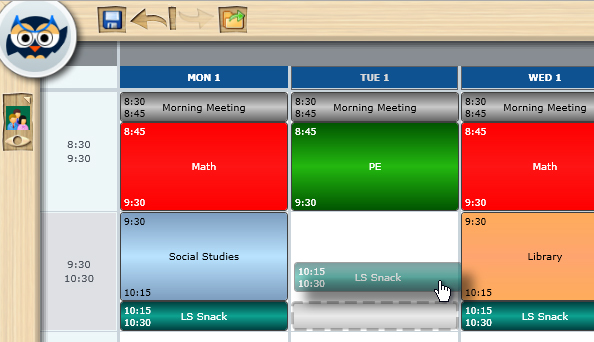 Timetable view performances are vastly improved so that large schools/colleges with 500 and more subjects/teachers can use our software without interruptions. Furthermore, our software will automatically adjust according to your computer's performances, e.g. faster computers will display card animations, while slower computers won't have such smooth experience. Talking about performances, timetable loading, importing and saving is 10x faster now! We have lots of plans for future releases. Since Prime Timetable is an online software as a service, you can expect frequent updates and improvements soon! As always, all our software updates and new versions are free of charge. Since, your feedback is crucial we have created Prime Timetable user voice, where you can shape our product to suite your needs by entering a new idea or voting for existing ones. This release brings Prime Timetable one step closer to our goal – to give you the best timetabling experience world-wide. Thank you for being part of it. In the recent version of Prime Timetable we have added Preview new version option in main menu. Clicking it your current timetable will be opened in the upcoming Prime Timetable 2.0. Instead of ribbon, there is only a school board with instantly available tools on board frame leaving more space for your timetables. There is a new optimized menu when you click the owl in the top left corner. New interactive board tools: Pin, Sponge and Zoom which make timetabling more fun. New Help -> Options where you can configure application as best suits your needs. User interface is redesigned and more natural with curved lines and nature associations (e.g. form background looks like a piece of paper). There are lots of animations which make application smoother. Performances are increased. For instance, timetable view is rendered much faster in larger timetables. 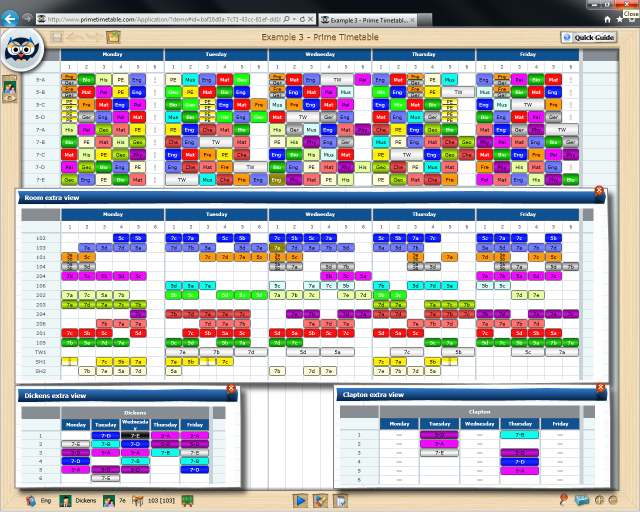 All these changes make timetabling faster, easier and more fun.